A quiet, yet hopeful group of young people gathered in front of the Museum of the Moving Image in Astoria, Queens on January 22, 2017. They heard rumors that some of their favorite celebrities, including Jaden Smith and Shia LaBeouf, were participating in an activity that included a broadcast to the internet. This select group would soon balloon to include hundreds of individuals, as the news of this particular performance and installation spread like wildfire over social media channels such as Twitter and Reddit. Luke Turner, Shia LaBeouf, and Nastja Säde Rönkkö launched the live stream of #HEWILLNOTDIVIDEUS after a short planning period of a few weeks and released it to the public to coincide with the inauguration of the 45th president of the United States of America on January 20, 2017. The project was hosted by the Museum of the Moving Image in New York, and consisted of live audio and video streams to the website HEWILLNOTDIVIDE.US. Billed as a “participatory performance,” it invited, “the public […] to deliver the words “HE WILL NOT DIVIDE US” into a camera mounted on a wall outside the Museum of the Moving Image, repeating the phrase as many times, and for as long as they wish.” Initially conceived as a way to bridge divides and act as a physical and digital gathering space, the project quickly became a logistical headache for those who ran the installation and for the museum itself. Crowds of people gathered at nearly all hours of the day to participate in this 24-7 live stream. The project was forced to shut down after only ten days at its initial home, yet this was not the only controversy to befall this performance project. Those who lived near the museum feared for their safety as the general camaraderie initially encouraged by the project gave way to a gathering place for those who self-professed their identity as the “alt-right,” a term coined to mask the white supremacy of Richard Spencer and others who use the internet to disseminate their caustic and ultra conservative ideas. Within less than twenty-four hours of its opening, the live stream had been co-opted and molded into a physical manifestation of the internet–a living socio-technical assemblage. What had started out as a participatory performance in a physical space had transformed into what Joseph Bernstein of Buzzfeed described as the “physical incarnation of social media,” with the ugliest parts of identity creation, authorship and maintenance heavily featured on this non-moderated feed for any denizen of the internet to witness. Media outlets picked up and amplified bizarre stories of “Nazi milk parties” and generally disruptive behavior, further adding to the mayhem of the internet feed. Some of the feigned frivolity and strange behavior attracted more members of this ultra conservative group to the activities surrounding this performance, both online and off. This project represents an example of the perfect storm of threats to the idealized cognitive model of the hegemonic political experience in America, containing all the elements that those who identify as far-right or white supremacist claim to be against. Here were three artists using a public institution to disseminate their ideas to the internet at large. The message, “He will not divide us,” coincided with the inauguration of a president who had become the symbol of the public power of these far-right groups, who felt they were being left behind in politics. This participatory event reveals the inner workings of these far-right groups’ pursuit of creating what Teun A. Van Dijk describes as an “ideological square.” These groups create an in-group and an out-group, “prototypically represented by the ideological pronouns Us and Them.” Digital personas and memes are employed in pursuit of establishing an in-group and an out-group. This particular performance exposed these processes by forcing participants in the live stream to step from their highly insulated online communities into a sphere of performance that reflected the public at-large. The cooperation between members of far-right groups to sabotage this performance for their own needs constitutes a type of counterpublic, a term coined by Sarah Jackson and Brooke Foucault Welles while observing other social media co-option efforts by underrepresented communities in the past. Instead of countering the dominant hegemony and narrative, “alt-right” individuals employ these tactics to enforce political norms in both the virtual public spaces created by social media and in the space delineated by the participatory performance. Identity creation and manipulation is cooperatively authored by this group, born and incubated on the internet, and portrayed through physical performance of online memes. Among many memes, some of the most frequently performed memes referenced Pepe the Frog, and the ability to consume milk in massive quantities, partly due to the feedback effect of both digital and traditional media. Ten days after the appeal to the ACLU and no response from the organization, the piece at the Museum of the Moving Image was closed down, with the museum staff citing security issues over growing crowds and disruptive behavior. Disappointment was apparent for not only the creators, but the “alt-right” group that had co-opted the stream to spread messages to those both inside and outside of their ideological group. A little over one week after the shutdown, on February 18, 2017, the piece of art moved to downtown Albuquerque, NM relocating to a wall outside of the El Rey Theater. The project in its new location also faced a number of security issues, including reports of gun shots near the location. The website and live feed went dormant for a few weeks, only to reappear again on March 8 as a video of a flag emblazoned with the words “HE WILL NOT DIVIDE US” in simple black script in an undisclosed location. In a matter of days, however, internet trolls and the neo-Nazi Traditionalist Workers Party were able to determine the location of the flag and steal it. Subsequently, as of March 22, 2017, the project had been adopted by the Foundation for Art and Creative Technology, Liverpool. The final adopter of the project, Le Lieu Unique, has hung the flag above an art museum in an old biscuit factory in the French city of Nantes, and has a camera filming the flag at all hours of the day. These online actors employ several strategies—secret argot, often referred to as dog whistles, impersonating the opposing groups’ performance of identity, and taking advantage of the unique isolating structure of the internet—all in pursuit of what Teun A. Van Dijk describes in his cognitive-sociological work as the “ideological square.” These identity performance tactics are meant to establish an in-group and reinforce the idea that those who are outside of the group will never penetrate the boundaries of the in-group. Further, individual attitudes are also controlled by those within the group, “mental models formed by individual members of a social group may be ideologically controlled by socially shared group attitudes about a specific issue.” Language and symbolic behavior plays a key role in establishing this type of in-group behavior and attitude, often without one central member of the group controlling or authoring the attitude. In this case, digital language has been expanded from the face-to-face communication of those of the “in-group” to the choice of memes that incorporate visual media. This type of visual communication has become the preferred medium in which to transmit these messages between members of the group. One key example that demonstrates the power of identity creation through these visual media is the fact that groups choose to imitate each other on social media. Impersonation and performance of identity is not a new tactic in the book of factions and groups competing for the hearts and minds of those in public spaces. This type of ideological warfare is not even necessarily a new concept; there are documented cases of Communists impersonating Nazi officers in the Weimar Republic in the events leading to World War II. These impersonators received their own code name, often being referred to as “beefsteaks”—those that looked like Nazis on the outside, yet would bleed Communist red once cut. This infiltration and explicit identity impersonation was undertaken for at least two reasons. The first reason was that impersonation was undertaken to discredit those on “the other side” of the argument. That is to say, the impersonator would commit acts that made the other side appear inhuman, cruel, and untrustworthy. By impersonating the “bad actor” (defined by those who are in-group), impersonators may instigate and sow discord both within the group and outside of the group. The “bad actor” simultaneously destroys trust networks within-group and delegitimizes the group for those outside of the nucleus of the group. An example of impersonation in action includes several “alt-right” groups creating fake Twitter profiles in May 2017, impersonating chapters of the Anti-fascist movement (often abbreviated as Antifa). The issue of impersonation has always plagued social media from its inception, yet the goal of these impersonations is to weaponize the identity of the competing ideological groups. These Twitter profiles appeared to coincide with the Memorial Day holiday weekend, and claimed to celebrate photos of vandalized graves of veterans in cemeteries. To combat this action, intrepid social media users used Google’s reverse image search option to discover that the images and Twitter accounts featured were not part of the Antifa movement, nor were the vandalized graves particularly recent examples. The double cross and identity impersonation had served its purpose to discredit the actions of these anti-fascist groups. In contrast to these online impersonations, performers on #HEWILLNOTDIVIDEUS would find it nearly impossible to accomplish this type of impersonation, due to the non-anonymous nature of the live video stream, as opposed to the anonymous membership of online social media communities. A second reason for identity impersonation is to gather intelligence about the plans and actions of the “other side.” Beefsteaks in the Weimar Republic infiltrated Nazi officer circles to not only discredit the regime, but also to gather intelligence on the plans of their enemy. Groups on either side of the political spectrum seem to be highly aware of this tactic; journalists, who have an interest in reporting on these groups, must legitimize their authority and convince the interviewed party that they are not “working for the other side.” Traditional media offers both opportunity for publicity of the cause of these groups, but also opens these groups up to critical scrutiny. Journalists are not the only force influencing the authorial power of identity creation on the internet. Algorithms serve a large role in the authorship of the types of memes that get disseminated throughout the network. The term “filter bubble” was first popularized by Eli Pariser in his 2011 eponymous book. Pariser raises serious issue with algorithms that have been created to deliver the most relevant information for each user on the internet. Pariser first became concerned when he observed his friends with conservative viewpoints had all but disappeared from his timeline on Facebook. At first glance, this appears to be a benevolent feature of the internet. After all, with hundreds of hours of video footage being uploaded just to YouTube every minute, how are users expected to sift through all of this information? Social media companies have become increasingly aware of users’ attention spans and work very diligently to maximize their time on various platforms. The insidious nature of these relevance algorithms appears when individuals begin to exhibit homophily. For instance, on Twitter, individuals will follow those whom they support and with whom they feel an affinity. This feeling of homophily leads users of social media to believe that their viewpoints are shared with a majority of those around them, since their self-selected social media circles also exhibit similar views. The perception expands Jürgen Habermas’s conception of the public sphere to a new networked public sphere, accounting for these social interactions governed by these networks enabled by the internet. Still, the sense of public space is obscured by the fact that these spaces are far from public, and are in fact hyper-individuated by the algorithms that govern social media. The dream of the internet of the 1990s—a vast, open, and transparent structure that democratizes all information—has slowly been dying, and not all users understand this concept. The misunderstanding of this concept is evident in the “fake news” crisis that permeated the 2016 United States Presidential election. Demeaning mainstream media and vilifying journalism is a large part of the “complex meta-strategy” of creating the ideological square, where “group members tend to speak or write positively about their own group, and negatively about those outgroups they define as opponents, competitors, or enemies.” Tarleton Gillespie cautions against vilifying the algorithms themselves in the creation of this filter bubble crisis, as filters are reflections of the social ideologies of their creators. Users may further socially construct with the affordances of these algorithms individuated publics that may not reflect the lived experience beyond social media and the internet. These toxic technopublics then leech out from online creation in unexpected ways, as performances in #HEWILLNOTDIVIDEUS demonstrate. In the face of this phenomenon, Nieman Journalism Lab journalist Joshua Benton explains that he had been once a skeptic of the dangers of “filter bubbles.” His observation, after what he and other journalists—including Craig Silverman of BuzzFeed—witnessed in this election, is that relevance algorithms on social media pose a very real and certain danger to shaping the ideologies of the millions of daily users of these services. Memes, neatly packaged and easily replicated and disseminated through social networks such as Facebook and Twitter, are the perfect media for group identity creation and communication. The word “meme” was first coined by Richard Dawkins in his 1976 book The Selfish Gene. A meme, in this instance, acts as a unit for carrying cultural ideas, values, and meanings that can be easily duplicated and transmitted. Dawkins gives several cultural examples that include song, aspects of architecture, and even the concept of God. The internet is the perfect breeding ground for these ideas that are often compared to a virus, as social media is purposely designed for the transmission of ideas between users. For example, total war rhetoric has become intimately entwined with this meme-y mode of performance, leading to dangerous beliefs about how society ought to be constructed. This war-like rhetoric is then reflected in the traditional media (news sources online, popular blogs, and television), thus legitimizing and reinforcing the original message that these groups are at war for the very hearts and minds of all participants on the internet. This identity performance as part of this “Great Meme War” that is being waged between groups, manifests itself in different ways with different goals. Maintenance of the ideological square, meme transmission, networked public spheres, and identity creation all intersect with one another in the performance of #HEWILLNOTDIVIDEUS, with several spoken memes that directly reference the war-rhetoric of Nazis, Hitler, and his Third Reich. Bodily performances included salutes, and the display of white supremacist tattoos for the live feed. That these performers in New York gathered in groups served to embolden these performers in a series of escalating public displays, including drinking milk, as will be discussed in more detail later in this article. Visual and verbal memes are coded within performance of identity and spill over into the physical sphere in different ways. In a complex nod to the existence of these memes as entities themselves, participants in the digital creation of memes must physically share these memes through their mobile devices. In this case, the medium is the message. The fact that the message exists as a serious of pixels on an iPhone makes neither the medium nor the message any less “real” to those who use it as a part of a performance of their identity. The meme continues to be treated as an object with the virulence and cultural power that conveyed the message in the ephemeral moment. The act is then replicated several times and disseminated through social networks as both video and a moving Graphics Interchange Format (GIF) attached to tweets and Facebook posts. The level of performance varies wildly and serves to demonstrate for both intended audiences outside of and inside the established group. In an attempt to explain the appeal of the use and dissemination of memes, George Lakoff and Mark Johnson introduced the phenomenon of schematization and semantic frame building, a psychological phenomenon where humans create patterns by fitting their perception of their experiences into large embodied metaphors. These embodied metaphors that govern human perception are referred to as “Idealized Cognitive Models,” in which a central stereotypical member exists. The idealized cognitive model that drives conservative viewpoints may in part be responsible for the organization of groups that lean the farthest towards conservatism on the political spectrum. It is embodied experience of some form of lived metaphor that shapes the ideas of those who live in a specific culture. In this instance, the generally embodied experience of alt-right or ultra-conservative individuals includes perceptions of dehumanizing experiences of insufficiency in the patriarchal and economic structure in which they find themselves. Online, individuals like Richard Spencer use this point of view to craft a digital environment that addresses these feelings of insufficiency, while providing a structure through a paramilitary or militia-like organization. Members of this group feel fulfilled through online participation and begin to embody the structures fed to them. This paramilitary stance achieved two things: creating a schema through which individuals may frame their individual experience, and establishing legitimacy of belligerent status, should individuals who may oppose these ideas decide to take action against this group. This construction of identity condones use of force and military tactics both online and off. A shared identity construction means rewriting the rules of this kind of militaristic identity for the new networked public sphere in which the discourse is found. Historically, the legitimate authority regarding warfare that had been enjoyed by state entities has been shattered or corrupted by intra-state actors, also vying for legitimate recognition of belligerent status. A just war requires legitimate authority for the war-like activities undertaken by states in traditional warfare. Increasingly, however, warfare in the 21st century does not include traditional state entities at war with one another. The new warfare includes factions within and without borders and the oversight of governments. A.J. Coates, quoting J. Keegan, argues in The Ethics of War that “The increasing predominance of internal over external or interstate warfare has led some to conclude that in the future war is likely to consist in ‘a fight for civilization—against ethnic bigots, regional warlords, ideological intransigents, common pillagers and organized international criminals.’” An overwhelming fear is that this prescient quote from the early nineties has come true and that militaristic factions have chosen the internet as their “battlefield.” There are abundant pieces of evidence that intra- and extra-state actors are driving war on digital fronts specifically, taking advantage of technological opportunities presented by features such as YouTube’s relevance algorithms and general lack of oversight of content to advertise to individuals susceptible to their messaging. A part of mounting a successful campaign for the hearts and minds of the public is appealing to the legitimate authority of the movement. In order to claim that legitimate authority, actors within groups must strive to create a cohesive identity for the group and the philosophies that govern the group, which is aided in part by the creation of the ideological square. Part of this cohesion is the consistent performance of identity, which includes the public persona exhibited by these groups. By extension, contemporary identity performance often includes digital performance on various social media platforms. The performativity of such acts appeals through affect to those who are susceptible to messages that appeal to their lived experience. These acts of identity are reflected through dissemination and result in a kind of mass authorship of identity. Enterprising and influential members of the movement will manipulate these identities to update and echo shared experience with in-group members. Brian Massumi, in his 2002 book Parables for the Virtual: Movement, Affect, Sensation, discusses the use of socially shared sign posts as a shared experience of affect. Massumi primarily focuses on affect and develops the theory that corporeal sensation connects with “exoreceptive sense perception.” As the body folds both infinitely and without itself, increasingly, the exoreceptive sense perception is extending to online persona creation. The emotions and actions of the body affect the environment in the same way that the environment affects the body. This reciprocity of affect, then, expressly connects bodies in networks of shared experience. War rhetoric literally creates what Judith Butler declares is performativity, “the power of discourse to produce what it names.” The performance of a war-like identity, through self-established identity performance, along with the framing reaction of the media, creates quite literally, a war-like scenario in digital space, i.e. an affect of war-like preparation. The ultimate concern is when this digital affect spills into the physical space, with real world consequences for those who recognize this war-like affect and oppose it. The live feed #HEWILLNOTDIVIDEUS opened with the help of Jaden Smith (the famous son of Will and Jada Smith). He stood for five hours on the opening day of the live stream, chanting and reciting the mantra, “He will not divide us.” The momentum and celebratory atmosphere of the first day was soon replaced by members of far-right groups co-opting the feed to share their messages, coded with dog whistles (secret code words that signal in-group belonging), all in a general atmosphere of intimidation. The media picked up the story and framed it as a kind of anti-Trump protest, even though Rönkkö, Turner, and LaBeouf did not make any such explicit claims in their art installation. Since media outlets echoed the story through their channels, the live feed became a sort of physical social media incarnate, stepping through digital affect to a space bound by physical dimensions and time. Those who profess far-right ideologies, white supremacists, and users of 4chan and Reddit were not the only participants in the feed. Plenty of people appeared out of the woodwork, grabbing their fifteen seconds of fame on the internet, often advertising their own social media accounts and asking all those who had been witness onto the live feed, which was available to any who had the URL. This nexus of social media transcended the highly individualized filtered digital spaces found online and entered into a true physical public space bound in time and place in ways that the internet is not usually bound. The live feed itself captured and preserved the video, archived by the website itself, yet within hours of the site’s launch, there were several dedicated YouTube and other feeds capturing and preserving the video that was broadcast from the space of the performance. The interplay between real time and the ephemeral performance of social media identity was captured and amplified by the very interface that made its existence possible. This setup became a version of a hyper-mediated haunted stage, complete with the mechanical memory of auto-capturing the live feed and preserving the video to YouTube. This video and audio archive provided a stock of recycled images that remained rife with the possibility of becoming the next meme in the process of creation and authorship. Truly the idea of authorship shifted from ownership of the conception of the project by Rönkkö, Turner, and LaBeouf to the mediation of the project through a multi-faceted authoring reflective of content creation on the internet. One of the first memes emerging from the alt-right came the day after the inauguration, when one participant stood behind Shia LaBeouf and briefly flashed the screen image on his phone of a green character well known to many in the sub-group. Pepe the Frog, a character drawn by Matt Furie on his web comic and first appearing on MySpace in 2005 as a part of a series titled “Boys Club,” had been used quite heavily in the past as a kind of in-joke among “alt-right” leaders. According to the original cartoon author, Pepe “is a mellow dude getting stoned with his friends, regularly engaging in gross-out humor.” While the author maintains that Pepe was created as a benevolent figure, it was an insidious mix of cultural stereotypes meant to reinforce negative views of Latinx people in the United States. Pepe the frog was a foul-mouthed pot-smoking character that could easily be co-opted by a group attempting to vilify immigrants in order to serve their ideologies of racial purity. It was a small logical leap for this character to be appropriated by the online far-right “meme militias” and promoted into an unofficial mascot for white supremacists who inhabit the subreddits r/pol and r/altright. The author was so horrified by the abuse of his figure as hate symbol, that he tried to “kill” off the character of Pepe in a 2016 cartoon. Of course, one cannot kill an idea or a meme, once it has been hijacked as an identity marker by an in-group. Figure 1. Twitter’s self-referential meme demonstrating the social construction of media, (Tweet from unknown author, 2017). The selection of a particular symbol is semi-arbitrary, yet the meaning behind the symbol is what holds the social and political power. This seemingly complicated concept is not lost on these internet-based groups, since several examples of self-referential media exist and are disseminated through different social media, using the same apparatuses available to all social media users. The above example was found with a simple Twitter search of the hashtag #hewillnotdivideus and #hwndu and appeared in the “top” tweets, according to Twitter’s relevance algorithms. At least a few members of these groups are aware of the power of their collective identity performance, and the irony is not lost on them. In fact, the co-option of the hashtag, meant as a way for users to collate and quickly organize vast amounts of data, demonstrates conscious use of the social apparatus on Twitter. Part of identity creation includes the assumption of the “enemy’s” identity through their available modes of performance. This effect has been documented previously, where oppressed minority groups co-opted hashtags such as #MYNYPD to expose the injustices perpetrated by oppressive regimes. These minority groups create what Jackson and Foucault Welles call “counterpublics” that run counter to the overarching narrative in an effort to disrupt it. In a reversal, relatively small groups of “alt-right” members, who benefit from hegemonic norms, employ the same hijacking techniques as these minority groups, flooding well-intentioned social media movements with vitriol and their war-like rhetoric. This type of culture jamming instead creates a toxic technopublic that serves to continue to benefit those who already benefit the most from political hegemony. The use of Pepe the Frog as a part of this hijacking forms a calculated attempt to co-opt the narrative and bend it to the will of a handful of “alt-right” individuals. Pepe makes an appearance not only online, but several times physically throughout the public performance of #HEWILLNOTDIVIDEUS. One of the most popular and often recreated performances of physical memes on the #HEWILLNOTDIVIDEUS feed is the drinking of copious amounts of milk. Here I want to contrast two different performances of white supremacy exhibited in two separate locations of the #HEWILLNOTDIVIDEUS feed. Both incidents involve the specific performance of the visual meme of milk drinking. This performative and nearly ritualistic act of milk drinking, to those who run in white supremacy circles, has become a dual symbol. Folk beliefs, as evident in online discussion, trace performative or ritualistic milk drinking to the superior lactose tolerance of those of the Aryan race, as opposed to those whose genetic makeup does not allow for such consumption. Many also appeal to the more iconic significance of the “pure white” color of milk as a symbol for racial purity. The symbolic milk drinking is a divider between in-group and out-group (those who possess lactose intolerance and literally cannot partake in the activity), while simultaneously serving as a visceral example of Butler’s understanding of performativity, where discourse produces literally what it names. By ingesting the material support of the movement’s racial symbol, these milk drinkers supposedly come to incarnate the “purity” which they strive for. There is no doubt that some extreme white supremacist circles already used milk as a symbol before the live stream of #HEWILLNOTDIVIDEUS. However, the popularity of this meme as means of identity creation sky rocketed after performance and documentation of this ritual on screen. After the live stream milk-as-white-supremacist symbol began to propagate more quickly, it culminated with an article posted by People for Ethical Treatment of Animals (PETA) and drawing clear connections between milk drinking and white supremacy, even animal cruelty. Appeals to wider popular culture opens this article: “As when Christoph Waltz’s character in Inglorious Bastards drinks a glass of milk and a character in a pivotal scene of Get Out sips the cow secretion, dairy milk has long been embraced as a symbol of white supremacy.” Traction by traditional news sources led to a harpooning of the practice by PETA, which in turn was touted as a victory on Twitter and mocked by chants of “down with the vegan agenda.” The transference of milk drinking from in-group activity to identity performance for the out-group was complete. It is hard to nearly impossible to predict the path of memes like this performative act, created as a symbol of identity by white supremacist and hate groups, mediated through #HEWILLNOTDIVIDEUS and subsequently re-distributed through white supremacist networks that were taking part in the liminal public space of real-time live performance. As a reaction to the popularity of these videos, Richard Spencer changed the frog emoji in his Twitter name (broadcasting his knowledge of Pepe the Frog) to that of a glass of milk. Many other members of far-right groups changed their Twitter names to follow suit. A cursory check on Twitter’s emoji search function reveals thousands of Twitter accounts that also feature the frog emoji, along with evocative hashtags such as #deplorable (which was co-opted from an electoral insult presidential candidate Hillary Clinton produced during a hot-mic incident), and #MAGA (an acronym for Trump’s campaign slogan “Make America Great Again.”) serving as signposts to their far-right ideologies. 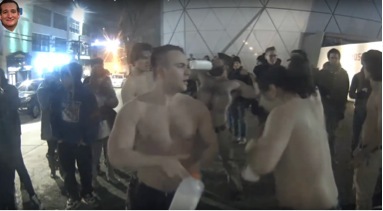 In the original New York City milk drinking performance featured on #HEWILLNOTDIVIDEUS, several shirtless men gathered in front of the live stream camera at night in the Northeastern winter weather for what would later be called a “Nazi party” by several sources, including clips found on YouTube. Each man was holding and drinking from gallon-sized milk containers. Yet, they were boisterous in their mannerisms and emboldened by the numbers of participants both physically present and on the stream, loudly and proudly declaring their identities, yelling profanities and yelling, “down with the vegan agenda.” In the video, many shirtless participants showed off their physique and tattoos that included white supremacist imagery. This performance was meant to be witnessed by not only those who were physically at the location of the live stream, but the millions more who had tuned in to watch the live stream as a result of traditional media coverage. Their audience, in this case, was a combination of in-group white supremacists who knew of the symbol and the out-group due to the public nature of their performance; these white men were defiantly performing who they were for everyone to see, both online and off. The main video, titled He Will Not Divide Us ( ” Nazi ” Party FRIDAY NIGHT ) hwndu hewillnotdivideus racist milk was posted on February 5, 2017, and at the time of writing had garnered 175,209 views. Figure 2. Screen shot from video of “Nazi Party” captures a group of men drinking milk and chanting (YouTube video from Wyatt Pahr, February 2017). The visage of Ted Cruz (upper left corner) is used by Pahr as a watermark for his particular YouTube channel. 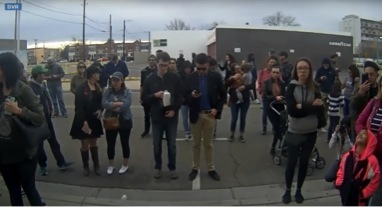 A separate incident of identity performing milk drinking appeared weeks after the initial “Nazi party,” from the second location of the stream in Albuquerque, NM. In contrast to the boisterous party bolstered by conversation that ensued from the first performance, one young man stands among a quieter crowd in broad daylight. This was on one of the first days of the second iteration of the stream which, like the initial performance, had attracted fairly peaceful protest. This crowd of about twenty were following the instructions of the piece and were chanting “He will not divide us” into the camera. This young man, placing himself centrally within the camera range, slowly slipped a half gallon of milk from a plastic bag to drink without bringing overt attention to his act. He seemed also to be aware of other participants in the stream, as he stopped his activity of drinking when another approached the camera to take up the entire field of vision. After the other participant had left, the first man resumes his activity of milk drinking, fully aware that those around him might not have let him continue his act had they known that this was a white supremacist meme for others who might be watching the stream. This young man was perhaps afraid that his presence in a physical public space stripped him of the anonymity that accompanies performances of identity on the internet. This forms a direct contrast to the boisterous party of the New York performance, where the number of members in the group offered relative safety from confrontation. At least one other stream participant of the in-group was watching, as he captured the live-streamed video and uploaded the video on YouTube. Titled Sneaking a Swig of Milk in during HWNDU (2017) and garnering less than 3,000 views, this video was not nearly as popular as the performative acts captured in New York City for the original stream. However, curiously, the act of sneaky milk drinking was re-captured and converted into an animated GIF image for use and dissemination on other social media sites such as Twitter, Reddit, Imagur, and 4chan. This GIF image became a short hand symbol, much in the way that Richard Spencer co-opted the milk glass emoji in his Twitter name. Figure 3. Screen shot from “Sneaking a Swig of Milk” captures one man sneakily drinking milk on camera (YouTube video from H Drone, February 2017, used with permission from LaBeouf Rönkkö & Turner). In this case, the actual act of drinking the milk was less important than the performance of the affect of milk drinking and possessing the sign that pointed towards the act of converting a symbol into a performance act. Drinking milk, as a bodily sensate activity, extends past the visceral experience, oscillating between the act itself and the meaning for which it stands. Added is the digital environment in which consuming the milk was witnessed, captured and disseminated over vast networks of social participants. That dissemination was part of the affective nature of the symbol itself, demonstrating the cooperative authorship of identity for internet trolls on 4Chan to white supremacists organizing elsewhere in different digital spaces on the internet. The performance of identity has often been used by opposition groups to galvanize both in-group solidarity and out-group exclusion. 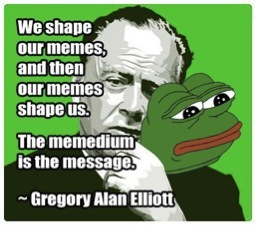 These tactics have existed as a social method of identity construction as part of Van Dijk’s “ideological square.” The meme is a convenient package for virulent messages that carry meanings larger than themselves. The addition of the digital to the performance of identity means two seemingly opposing ideas: the world-wide dissemination of these memes to as many people as possible, and the closed off dissemination in a personalized web governed by relevance algorithms. Memes are used in identity creation and then employed in identity manipulation as part of a creation of war rhetoric that has emboldened this group to act in tangible ways. Performance, often conceptualized as an agent for progressive social change and good, is vulnerable to being used as a tool to promote dangerous ideologies. The performances of identity that the live stream #HEWILLNOTDIVIDEUS captured digitally demonstrate the power of these memes to continue to perform identity—even the identity of those on the far fringes of the political spectrum. The war rhetoric in identity creation, used to convince many to take up a mantle and fight for a righteous cause, translates and spills over into real-life consequences and radicalization of theses internet groups. Clearly, the anonymity of the internet allows for people to author some truly insidious creations. Constructing a toxic technopublic in real time, participants in #HEWILLNOTDIVIDEUS demonstrate that performance of identity is not just reserved for positive social change—identity performance is reserved for the trolls, as well. Ellen Gillooly-Kress is a PhD student in the Theatre Arts department at the University of Oregon. Her work focuses on performance and the internet, and cognitive processing of language in theatrical performance. Shia LaBeouf, Luke Turner, and Nastja Säde Rönkkö. #HEWILLNOTDIVIDEUS, accessed June 11, 2017. http://www.hewillnotdivide.us. Tarleton Gillespie, “The Relevance of Algorithms,” Media Technologies: Essays on Communication, Materiality, and Society 167 (2014). Joseph Bernstein, “The Public Square Belongs to 4Chan,” Buzzfeed News. Last modified May 18, 2017. https://www.buzzfeed.com/josephbernstein/the-public-square-belongs-to-4chan?utm_term=.gijxZ6zmB#.tiMGDJZEm. George Lakoff, The All New Don’t Think of an Elephant! : Know Your Values and Frame the Debate (Chelsea Green Publishing, 2014), 56. Lakoff frames all political arguments in terms of a national conception of family. In his introduction, the conservative conception of family is defined as the strict father model, where the preferred method for obedience is physical punishment. Teun A. Van Dijk, “Discourse and Ideology,” Discourse and Society 9 (1998): 307-308. Sarah J. Jackson, and Brooke Foucault Welles, “Hijacking #myNYPD: Social Media Dissent and Networked Counterpublics,” Journal of Communication 65, no. 6 (December 2015): 932–52. Adrian Gomez, “’He Will Not Divide Us’ Video Stream Taken Down After Report of Gunshots,” Albuquerque Journal. Accessed February 23, 2017. https://www.abqjournal.com/955762/labeouf-takes-down-anti-trump-stream-due-to-reported-shots.html. The oft-cited and biblical example of soldiers using the pronunciation of the word “shibboleth” to distinguish between friend and foe, is an example of the “ideological square” in action, demonstrating the exclusionary/inclusionary nature of language employed in this way. Linguistic or symbolic markers that are characteristic of a certain group of people are used to the exclusion of other groups, often with severely negative consequences. Timothy Scott Brown, Weimar Radicals: Nazis and Communists between Authenticity and Performance (Oxford: Berghahn Books, 2009). danah m. boyd and Nicole B. Ellison, “Social Network Sites: Definition, History, and Scholarship,” Journal of Computer-Mediated Communication 13, no. 1 (2007): 210–30. Timothy Scott Brown, Weimar Radicals: Nazis and Communists between Authenticity and Performance, 110. Eli Pariser, The Filter Bubble: How The New Personalized Web is Changing What We Read and How We Think (New York: Penguin, 2011). Thomas Zeitzoff, “Does Social Media Influence Conflict? Evidence from the 2012 Gaza Conflict,” Journal of Conflict Resolution 16, no. 1 (2016): 29-63. Lewis A. Friedland, Thomas Hove, and Hernando Rojas. “The Networked Public Sphere.” Javnost – The Public 13, no. 4 (2006): 5–26. Pariser, The Filter Bubble, 12. Van Dijk, “Discourse and Ideology,” 397. Gillespie, “The Relevance of Algorithms,” 167. Richard Dawkins, “Memes: The New Replicators,” in The Selfish Gene (1976): 203-15. Marshall McLuhan, and Quentin Fiore, “The Medium is the Message,” New York 123 (1967): 126-128. George Lakoff and Mark Johnson, Metaphors We Live By (Chicago: University of Chicago Press, 2008 ). “Beyond Economics: Fears of Cultural Displacement Pushed the White Working Class to Trump | PRRI/The Atlantic Report.” n.d. PRRI (blog). last modified May 9, 2018. https://www.prri.org/research/white-working-class-attitudes-economy-trade-immigration-election-donald-trump/. While many Trump voters certainly do not identify as “alt-right,” many “alt-right” individuals have constructed their identity around their affinity for Donald Trump as president and will indicate so in their social media profiles. Anthony Joseph Coates, The Ethics of War (Manchester: Manchester UP, 2016). Coates is quoting from Keegan’s A History of Warfare (Random House, 1993). Ibid. As a counter to the video of an Antifa activist punching Richard Spencer on Inauguration Day, alt-right internet users were quick to capture and replay a video of an Antifa activist in Berkeley receiving the same treatment. “The Expendables” are a group of para-military left-behind action heroes led by Sylvester Stallone in a movie that premiered in 2010. Pepe the Frog will be discussed in depth in a later portion of this article. Van Dijk, “Discourse and Ideology,” 380. Brian Massumi, Parables for the Virtual: Movement, Affect, Sensation (Durham: Duke University Press, 2002). John Lutterbie employs the use of proprioception in his conceptualization of role creation and acting in Towards a Theory of Acting: Cognitive Science and Performance (London: Palgrave, 2011). Judith Butler, “Critically Queer,” GLQ: A Journal of Lesbian and Gay Studies 1, no. 1 (1993): 17-32. LaBeouf, Turner, and Rönkkö. http://www.hewillnotdivide.us . Marvin Carlson, The Haunted Stage: The Theatre as Memory Machine (Ann Arbor: University of Michigan Press, 2003). Shaun Manning, “Pepe the Frog Is Dead: Creator Kills the White Supremacist-Hijacked Icon.” CBR.com. Last modified May 6, 2017. http://www.cbr.com/pepe-frog-creator-kills-white-supremacist-icon/. Sarah J. Jackson, and Brooke Foucault Welles, “Hijacking #MYNYPD: Social Media Dissent and Networked Counterpublics,” Journal of Communication 65, no. 6 (2015): 932-952. Nikhil Sonnad, “What the rise of ‘its OK to be white’ says about the alt-right,” Quartz. Last modified December 7, 2017. https://qz.com/1144783/the-rise-of-the-alt-rights-catchphrase-its-ok-to-be-white/. Debate over the origins of this practice continues, with some scholars and journalists pointing towards the internet’s obsession with a 2011 photo of a woman bathing another woman’s feet with milk. The photo is also rife with Nazi symbolism and imagery. Other scholars date this practice as far back as a U.S. National Dairy Council pamphlet from the 1920s, “The people who have used liberal amounts of milk and its products are progressive in science and every activity of the human intellect.” Tracing the complex history of milk as a white supremacist symbol merits a more in-depth study which exceeds the scope of this article. The above theories are found in Andrea Freeman, “Milk, a Symbol of Neo-Nazi Hate,” The Conversation (August 30, 2017), http://theconversation.com/milk-a-symbol-of-neo-nazi-hate-83292. Zachary Toliver, “Why Cow’s Milk Is the Perfect Drink for Supremacists,” Peta. Last modified March 7, 2017. https://www.peta.org/blog/cows-milk-perfect-drink-supremacists/. Another example of the complications of online authorship: I had to untangle the permissions for these stills from YouTube. This still represents my screen shot of a YouTube video copied from another YouTube video that was a screen capture of a video feed of the live event. This image is used with permission from LaBeouf, Rönkkö & Turner. Van Dijk, “Discourse and Ideology,” 390.